There are some close-quartered tasks that a knife simply can't accomplish. As a solution, Kershaw's Siege Tomahawk is a durable and versatile utility tool that opens up a whole new world of tactical options. 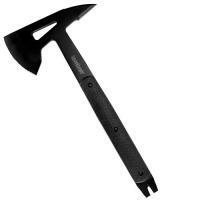 Its strong, full tang 3Cr13 steel hatchet head offers a powerful striking edge for breaching obstacles or splitting firewood, while the sturdy spike on the reverse side provides maximum penetrating force. At the base of the handle, the nail puller head can be used as a crow bar. With the addition of a durable black-oxide coating, the tomahawk becomes non-reflective and ideal for nighttime operations. The scaled black handle is cut in a rugged K-Texture™, hallmark to Kershaw's designs, providing an extremely secure grip.